I had an extra day off today, so I decided to make a bit of jewellery! The weather has been lovely here in Manchester, it's inspired me to create some spring/summer jewellery designs. 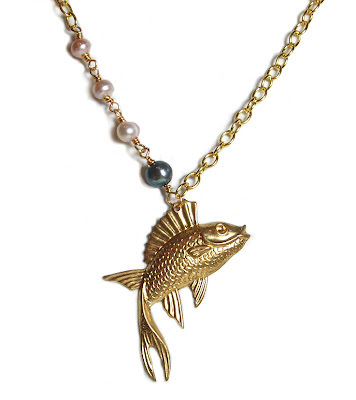 I decided to use this wonderful unique looking vintage fish charm which is of a typical nautical theme and compliment it with peach and grey coloured freshwater pearls and gold chain. I'm really happy with the simplicity of this necklace as it still manages to look unique. I'm hoping to be making some more designs similar to this. Available on Etsy and Folksy tonight. wow thats awesome!! i gonna follow you!! damn, you are good. I love your design and that fish is so cool.